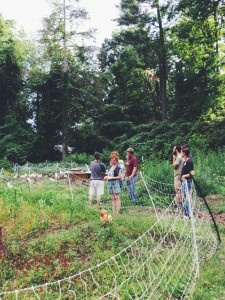 For our June WNC CRAFT tour we visited Patchwork Urban Farms in the heart of Asheville. 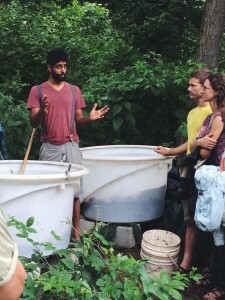 Our tour topic focused on “Multi-Plot Urban Farming.” Patchwork founder and farmer Sunil Patel started the farm last year as an incubator project with Bountiful Cities. 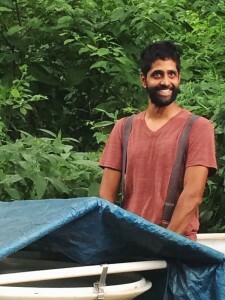 With a $25,000 initial investment Sunil launched the farm on three patches around Asheville, and by the end of the year had expanded to six patches. Produce and chicken & duck eggs were marketed through a 20 member CSA, roadside stand, and a handful of local restaurants. 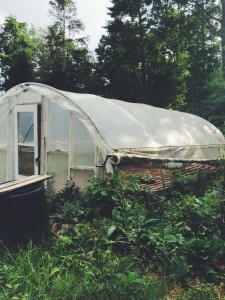 Their production methods draw from organic (not certified), biodynamic and permaculture practices. They started the 2015 season expanding even further to nine patches totaling almost three acres, and a growing list of potential land patches around the city. 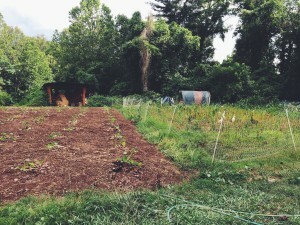 We started the farm tour on a patch in West Asheville growing it’s first crop of greens, and transitioning to summer crops with cucumbers and basil. Sunil began the story of Patchwork Urban Farm expounding on the big picture goals he has for the farm beyond simply raising crops. In many ways this is “a large experiment in trying to re-establish productive food systems where we live,” said Sunil. 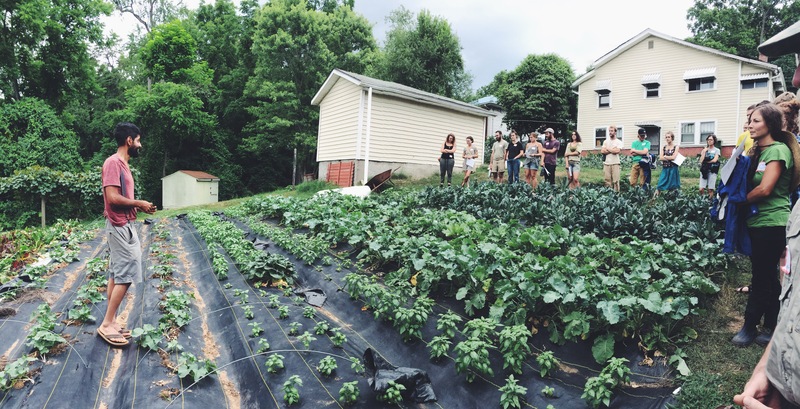 Multi-plot farming is not just a strategy to have land to grow, but also to create exposure where people see and participate in productive farm and food things happening in their everyday life. He recognizes that these are big cultural changes, and he believes that urban farming is an essential part of sustainable communities. It can provide opportunities for people to care for the land, natural resources, and one another as well as free themselves from the current economic paradigm – be truly responsible. 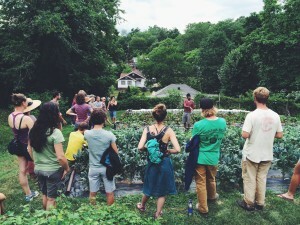 In addition to having Pathwork function as a place for someone to make a viable living, it will create new ways for people to connect and be involved in their community, provide greater food access for food deserts, and potentially provide cooperative structures between growers to pool resources and markets. A longer term goal is for the current plots to become future incubator sites for new multi-plot farm businesses helping kick start new urban farmers in the same way Bountiful Cities has helped Patchwork. 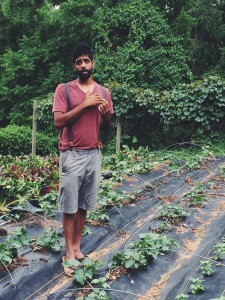 While Sunil has experienced amazing support from the Asheville community they have nonetheless faced some challenges as they go through the growing pains (pun intended!) 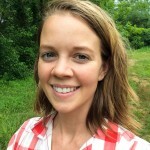 of establishing the farm business – as any new farmer does. Having increased their production so quickly moving from 3 to 9 patches from year 1 to year 2, Sunil feels they’ve jumped in faster than he would have liked. “The main challenge,” Sunil says, “is that we are essentially rebuilding from scratch on degraded land, and at the same time, we’re embedded in an economic paradigm that calls for a return on investment faster than small farmers can do it. 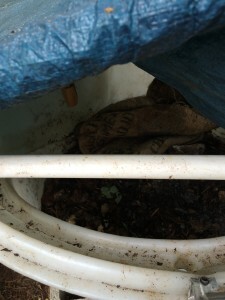 And the urgency to build soil is great.” He found himself planning based more on breaking even than the larger goals that have driven him to pursue urban farming in the first place. In order to get back to a slower timeline, they are canceling the fall crop and will instead work on laying a solid foundation for soil building, water management, and social structures – developing relationships with landowners, work traders and among small farmers. 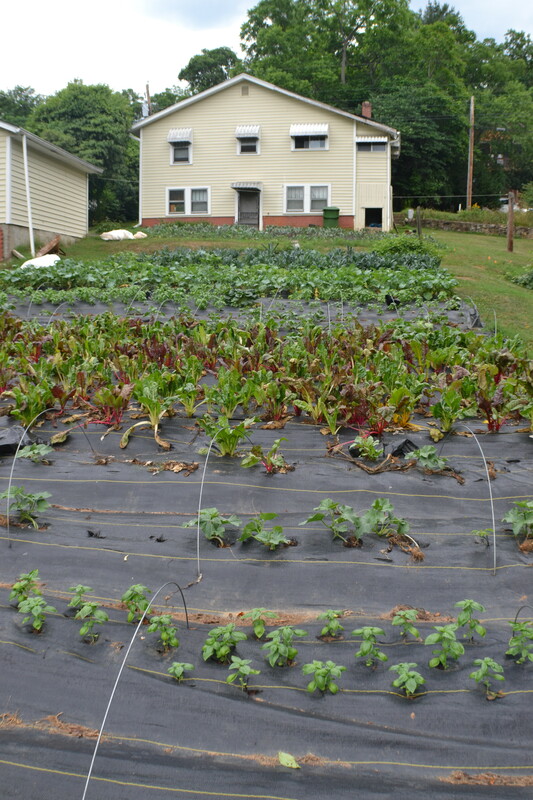 Another challenge for urban growers is working within the limits of city ordinances for animals. Because Patchwork is too small to be considered a “bonafide farm” he must pay permit fees for every patch where he would like to have more than 10 animals. And, those costs add up. Since he is leasing land with so many different landowners he has made a lot of gambel’s up front and is hoping to establish long term lease agreements and potentially have the landowner’s share in the investment. 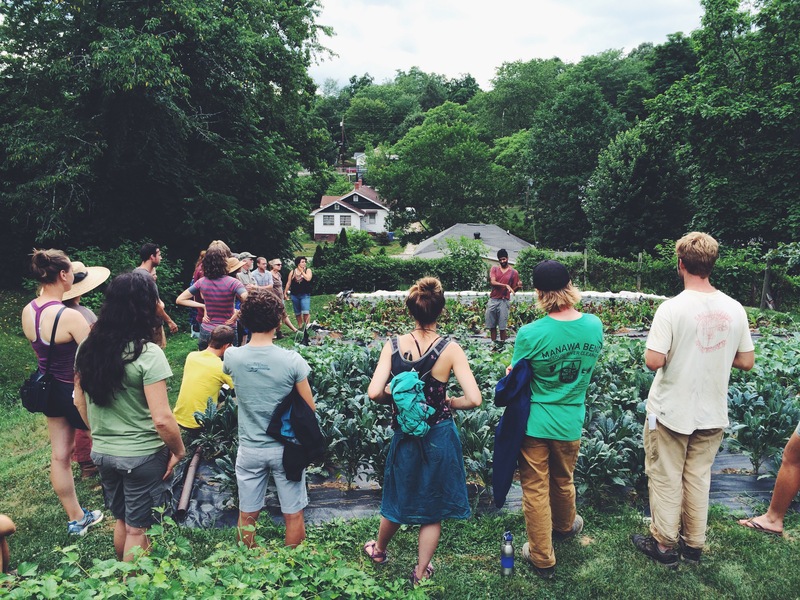 Our second and final stop of the multi-plot farm was Pearson Garden in the Montford neighborhood. Pearson Garden is part of Bountiful Cities, and where Pathwork Farm got its start. 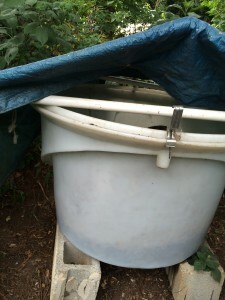 In addition to land to grow, they have access to a BCS tiller, other tools, a greenhouse, and a wash station. This year at Pearson they are rotating a laying flock, growing winter squash, and raising black soldier flies in Prota Pods. 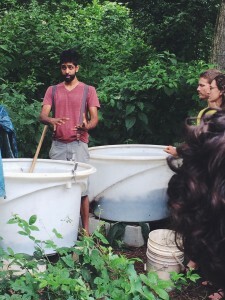 Some strategies for multi-plot farming that have been successful for Sunil & Patchwork Urban Farm include exchanging CSA shares for land use & weekly work trades. This season they have 17 work traders that exchange 2-4hrs/week working on the farm for a CSA share. Growing crops with similar management needs on patches that are clustered together cuts down on growing time and makes it easier to accomplish needed tasks. Landscape fabric has been a helpful addition this year, keeping weed pressure down. Seeing what Sunil and the Patchwork Urban Farm team have been able to do in a year is inspiring! A big CRAFT thank you for sharing your story, your heartfelt goals for the community, and expertise in “patching” together an urban farm. We learned so much! Hope to see you next time!